BBC’s Cell Spellman with winners of the WWF-UK Plant2Plate competition. A group of children from the UK are celebrating today as they scooped up first prize in a prestigious recipe competition. BBC Radio 1 DJ Cel Spellman presented children from The Oval Primary School in Birmingham with the prize for winning the WWF’s Plant2Plate recipe competition. Oval Allotment Cottage Pie, made using fresh ingredients grown on school grounds, impressed the judges for being organic, delicious and nutritious. Alpro and WWF-UK invited children from primary schools across the UK to cook up a delicious dish with fruit and vegetables grown on school grounds. The top 50 winning recipes will appear online. As winners, The Oval School will receive £1000 to spend on gardening and cooking equipment. 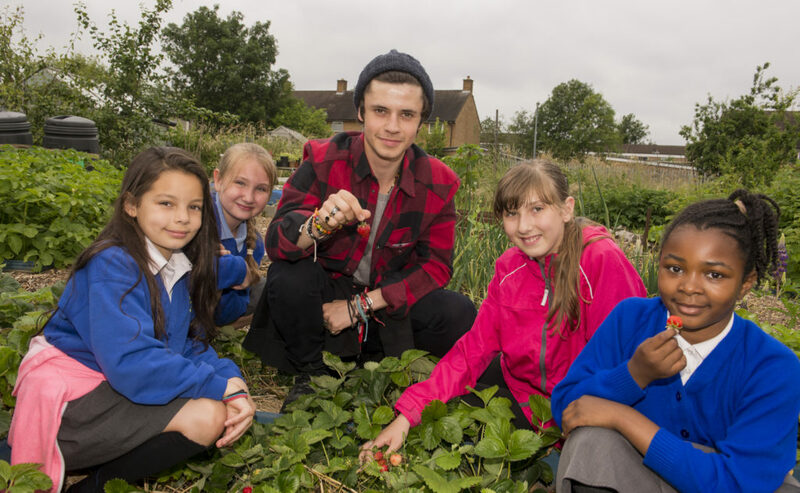 Cel Spellman said: “I spend a lot of my free time growing my own food in the allotment so it’s fantastic to see so many other young people learning about producing and consuming food in a sustainable way. The pupils at the Oval Primary School were extremely passionate and their cottage pie was delicious. It was a privilege to join their lunch and crown them the very worthy winners of WWF’s Plant2Plate. You can view and download the winning recipe here. Maybe you’ll cook it for your family?